We have carved a distinct position as the leading manufacturer and of Safety Door Grill. The array is designed by professionals and experts. Our organization offers our clients a huge array of Safety Door Grill. This product finds usage mainly in homes to provide security as it is very strong in structure. The designing of the array is done by professionals using trendy patterns. Safety Door Grill is rust proof and rigid in structure. It can be fixed with both wood doors as well as steel doors. Our company, Fab Tech is the renowned company which is involved in the manufacturingand supplying to our esteem customers. Our company was incepted in the year 2015 as a Sole Proprietorship (Individual) based company at Chennai, Tamil Nadu, India. Our offered range of services include Metal Gate, Metal Staircase, Window Grill, Safety Door Grill and many more. Moreover, we are also providing Fabrication Work. Our company assure our valuable customers that the quality of our products run as deep as the establishment of our companies. We provide the good and vast range of quality products with industrial norms and standards, service guarantee with customer satisfaction. 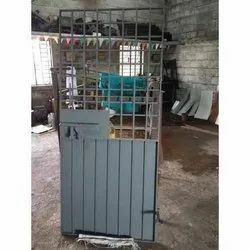 We are using the latest technologies in design and manufacturing steel gate, grill and trolley. We understand our client’s requirement so our structures are designed according to the customer’s needs with a specific time frame. Further, our products are offered at affordable prices according to the customer needs.